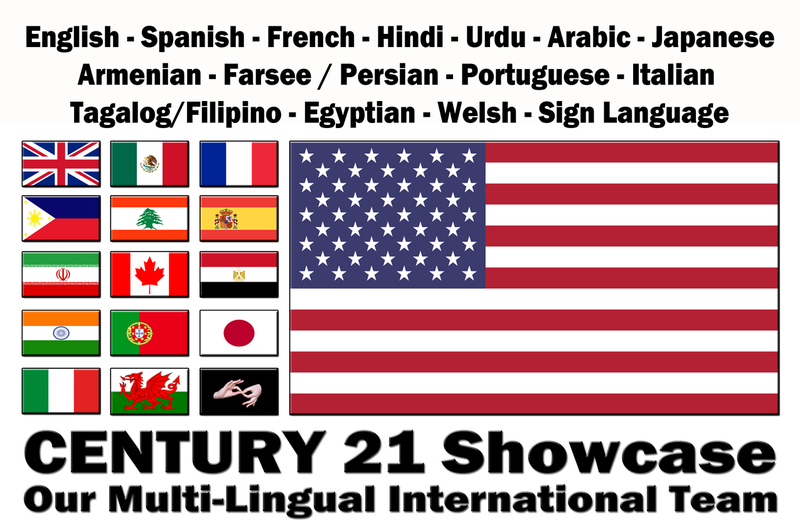 The Century 21 Showcase Group is a diverse team of Professional Inland Empire Realtors who are multi-ethnic, multilingual and extremely sales savvy. Showcase REALTORS® understand that relocating from abroad is not an easy process. Language barriers and cultural differences often cause communication gaps, which can make an already difficult process even harder. In fact, only 13 percent of English speaking agents can speak a 2nd language. That's why we are proud to offer a number of talented multilingual real estate agents to help you make a seamless transition into your new home in our local community. Work with an agent that speaks your language, and enjoy the most comfortable real estate experience possible. Buy or sell with confidence, with the peace of mind that only comes with working with a skilled professional. Simply complete the online form with your information, choose your language and we will do the rest. One of our talented, multilingual agents and the ‘Showcase team’ will assist you throughout your real estate goals. Based on information from CARETS as of 4/23/2019 1:12 PM CST. The information being provided by CARETS is for the visitor's personal, noncommercial use and may not be used for any purpose other than to identify prospective properties visitor may be interested in purchasing. The data contained herein is copyrighted by CARETS, CLAW, CRISNet MLS, i-Tech MLS, PSRMLS and/or VCRDS and is protected by all applicable copyright laws. Any dissemination of this information is in violation of copyright laws and is strictly prohibited. Any property information referenced on this web site comes from the Internet Data Exchange (IDX) program of CARETS. This web site may reference real estate listing(s) held by a brokerage firm other than the broker and/or agent who owns this web site. The accuracy of all information, regardless of source, is deemed reliable but not guaranteed and should be personally verified through personal inspection by and/or with the appropriate professionals. IDX by Commissions Inc.